Today I ended reading an interesting article by the 4th spanish ISP regarding IPv6 and CGNAT. The article is in spanish, but I will translate the most important statements here. The title of the article is “What is CGNAT and why is it used”. They start by admiting that this technique is used to address the issue of IPv4 exhaustion. Good. They move on to say that IPv6 was designed to address IPv4 exhaustion. Great. Then, they state that ‘‘the internet network is not ready for IPv6 support’’. Also that ‘‘IPv6 has the handicap of many websites not supporting it’’. Sorry? That is not true. If they refer to the core of internet (i.e, RIRs, interexchangers, root DNS servers, core BGP routers, etc) they have been working with IPv6 for ages now. If they refer to something else, for example Google, Wikipedia, Facebook, Twitter, Youtube, Netflix or any random hosting company, they do support IPv6 as well. Hosting companies which don’t support IPv6 are only a few, at least here in Europe. The traffic to/from these services is clearly the vast majority of the traffic traveling in the wires nowaday. And they support IPv6. The article continues defending CGNAT. They refer to IPv6 as an alternative to CGNAT. No, sorry, CGNAT is an alternative to you not doing your IPv6 homework. The article ends by insinuing that CGNAT is more secure and useful than IPv6. That’s the final joke. They mention some absurd example of IP cams being accessed from the internet by anyone. Sure, by using CGNAT you are indeed making the network practically one-way only. There exists RFC7021 which refers to the big issues of a CGNAT network. So, by using CGNAT you sacrifice a lot of usability in the name of security. This supposed security can be replicated by the most simple possible firewall, which could be deployed in Dual Stack IPv4/IPv6 using any modern firewalling system, like nftables. Others ISP operators are giving IPv6 strong precedence over IPv4, that’s the case of Verizon in USA: Verizon Static IP Changes IPv4 to Persistent Prefix IPv6. 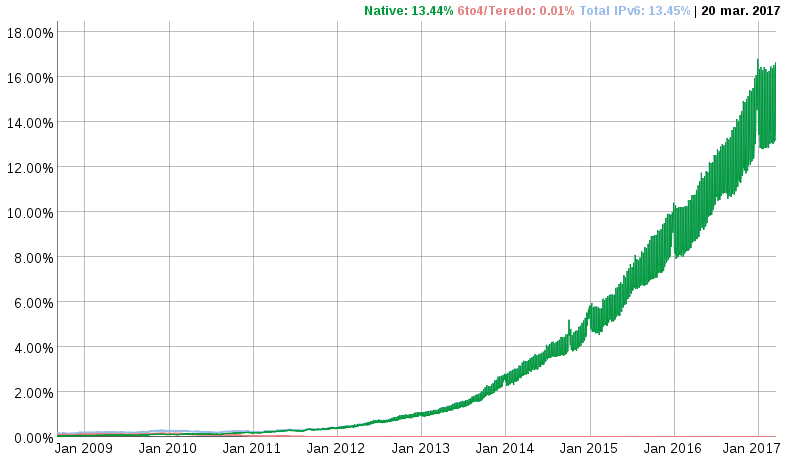 My article seems a bit like a rant, but I couldn’t miss the oportunity to claim for native IPv6. None of the major spanish ISP have IPv6.